Before getting to a couple of lessons we (Andrew Catton and Ben Matasar) learned building a Slack app, I should tell you about what we built. One of our goals was to make these very lightweight, like the real-life discussions they emulate. You create one, talk for a bit, and move on. If you want to have a related but different discussion, make a new Scatterdot. Think email thread, not discussion forum. Github gist, not repository. Quick conversation at your desk, not a meeting. Scatterdot began as a standalone app — in fact, it can still be used standalone today. To reach our goal of being lightweight, however, we needed to fit Scatterdot into people’s existing workflows. In particular, it needed to go where the conversations were already happening. For many people these days, that place is Slack. But what does it mean to fit into Slack? 1. No parallel permissions systems — just use Slack teams! 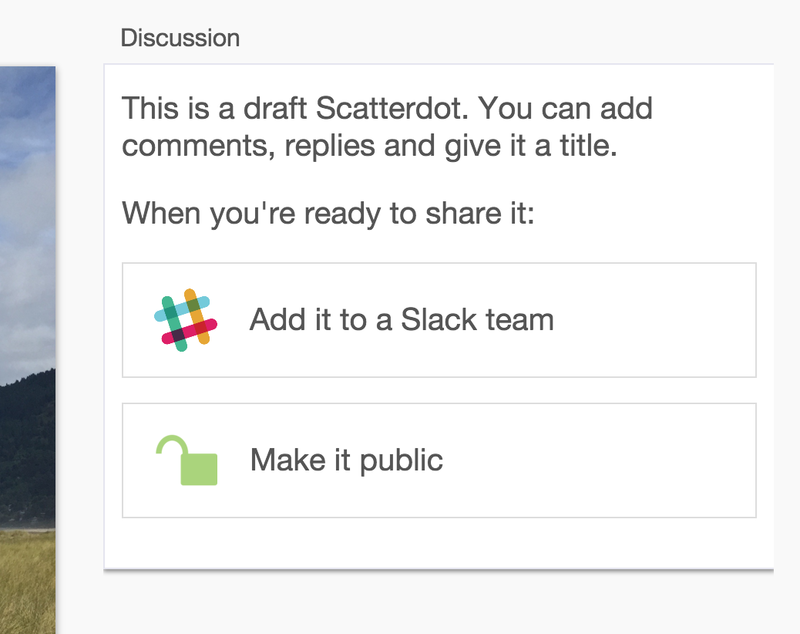 What this means is that anyone with access to that Slack team also has access to the Scatterdot. No other permissions, signup or maintenance is required. This will create a new topic with the appropriate Slack team permissions and notifications sent to the current channel. The first thing you see here is a notification from Scatterdot showing a zoomed-in preview of what @andrew pointed at and the comment. 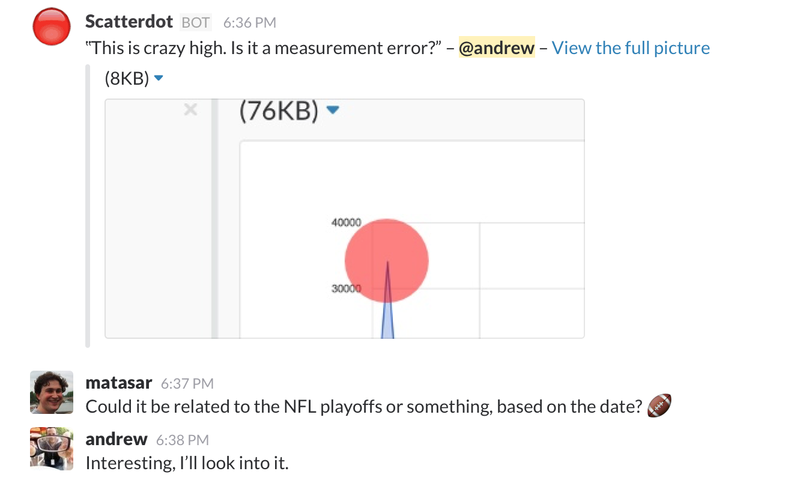 The conversation then continues in Slack, like any other. We expect that there are more lessons to learn about building apps that fit well into Slack, but we thought these were worth sharing. We’re finding Scatterdot to be a very useful tool for discussing visual things ourselves, so we also thought it was time to let others use it too.